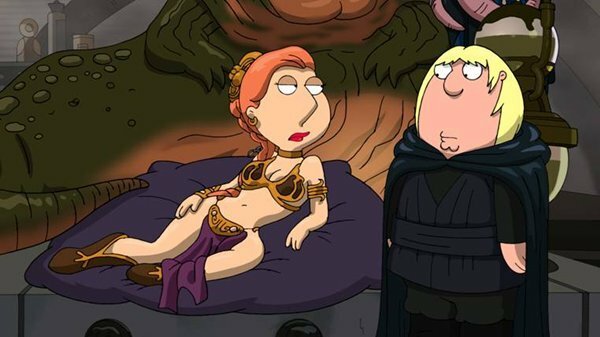 Take A Gander At Lois As Slave Leia From Family Guy: It's A Trap! Family Guy will be wrapping up its three-part parody of the original Star Wars trilogy this December with Family Guy: It's a Trap! The spoof of Return of the Jedi hits shelves December 21st on Blu-ray and DVD, and today Twentieth Century Fox Home Entertainment has released a new image of the Griffin clan's take on one of that film's most iconic images -- Leia in the gold bikini. It's a Trap! will once again cast the Family Guy regulars as assorted Star Wars stalwarts -- Chris as Luke, Lois as Leia, Peter as Han, and so on. They'll be joined by cameos including Adam West, Carrie Fisher, Patrick Stewart and Michael Dorn reprising their Star Trek: The Next Generation roles...and Rush Limbaugh as the Rancor. Is Fox/Netflix Deal Bringing Us The Wonder Years?